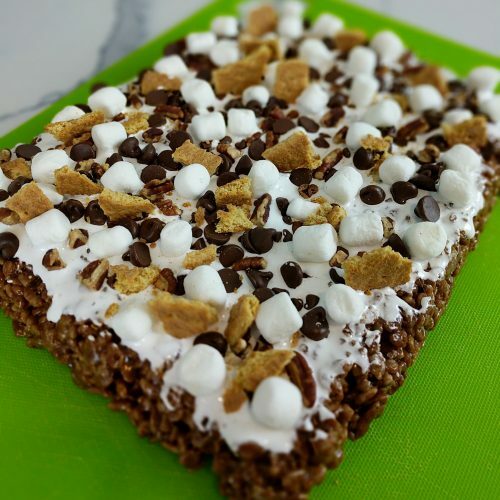 These S’mores Rice Krispy treats are anything but boring! They look very decadent but in my opinion they are just the right amount of sweet. 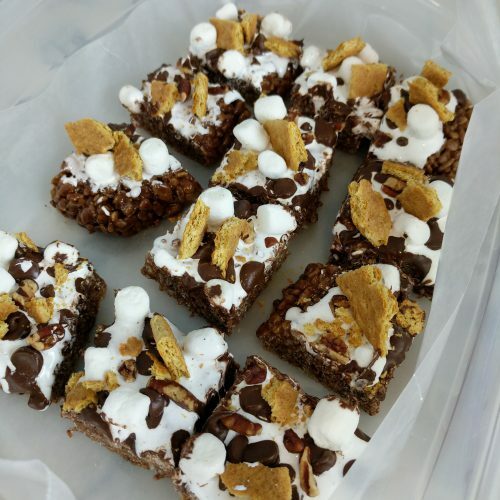 International S’mores day was this past Friday so in honor of the occasion I figured I would do a different take on your traditional s’mores! EASY TO MAKE, EASY TO CLEANUP! They are super easy to make and don’t require an oven during those hot summer months! 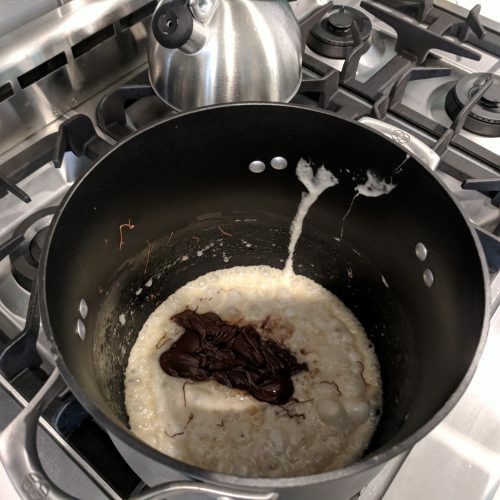 The marshmallow/nutella mixture literally just melts out of the pan so cleanup is easy peasy! Just be sure to use a non-stick pot (click here to view/buy the one I use) and line the baking dish with foil and you will be good to go. What more could you ask for?! Ok so lets be real here. There is only one REAL marshmallow creme and that is FLUFF!! However they don’t sell fluff over here on the west coast so I have to deal with Jet Puffed. Its actually not bad, I just don’t understand why the containers are so small! On the east coast you find huge jars of Fluff right where it belongs… next to the peanut butter. On the west coast you have to go to the baking aisle to find mini containers of jet puffed. Come on Jet Puffed… STEP UP YO GAME!!! 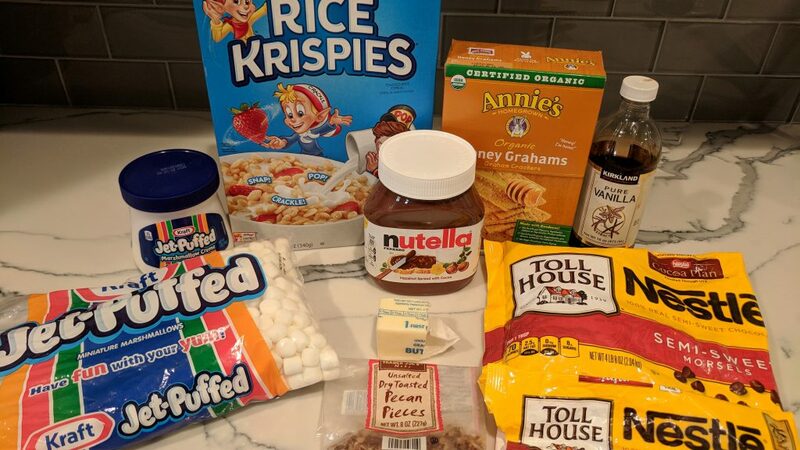 I use two different Nestle semi-sweet chocolate chip morsels in this recipe but truth be told you can use one size if you prefer to save money and buy one bag. They are both the same, just one is mini and the other are regular size chips. 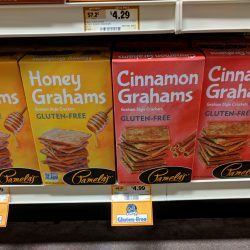 It won’t change the taste at all, I just like the different sizes for looks and bite variety. This recipe can easily be made gluten-free by using gluten-free graham crackers like I have photographed here. BEWARE of the marshmallows that you use. If you use Jet Puffed (as shown below) you will be good to go. I say beware because some marshmallow companies use a wheat starch so obviously that would make them non gluten friendly. I added the graham cracker topping at the end and then again after I cut the squares. 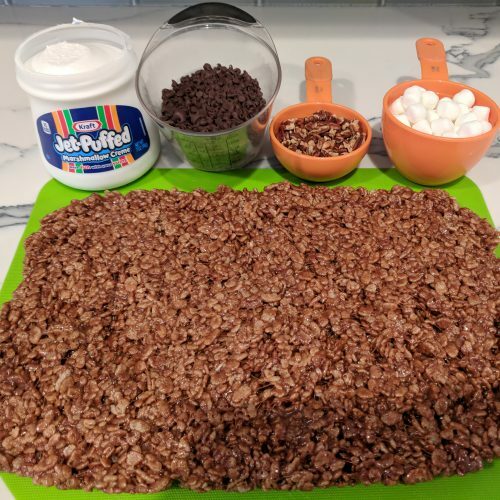 I suggest doing that with the marshmallows as well to ensure that each square is filled with goodness! I know you will enjoy this dessert as much as we do!! 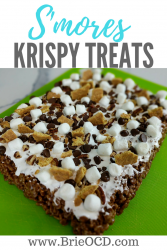 not your typical rice krispy treat! generously line a 13x9 baking dish with foil. lightly spray with cooking spray. 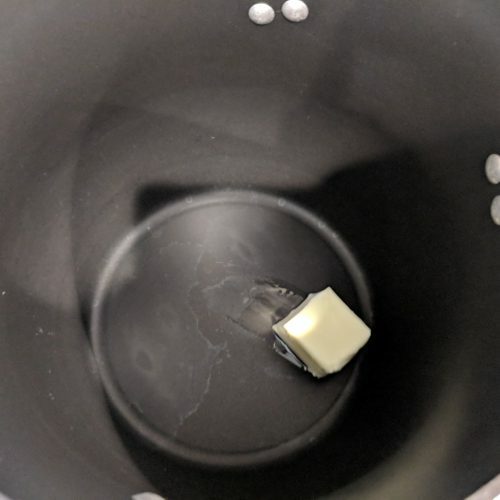 in a large pot (click here to view mine - 8qt) melt butter over medium-low heat. add 10.5 oz bag of marshmallows and stir with a spatula until melted. add nutella and vanilla extract and stir until smooth. turn off heat. 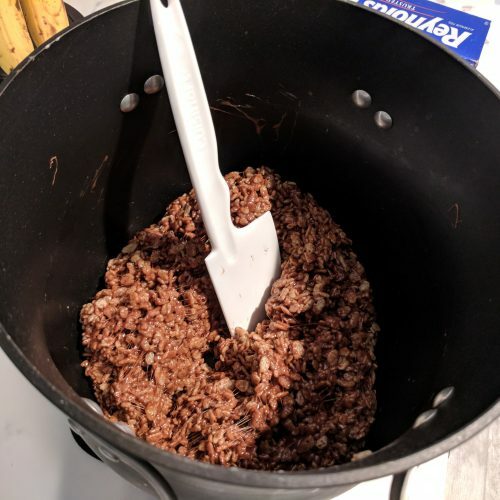 stir in cereal until it is coated with marshmallow/nutella mixture. transfer cereal mixture into baking dish and press until evenly distributed. let cool for about 10 minutes. 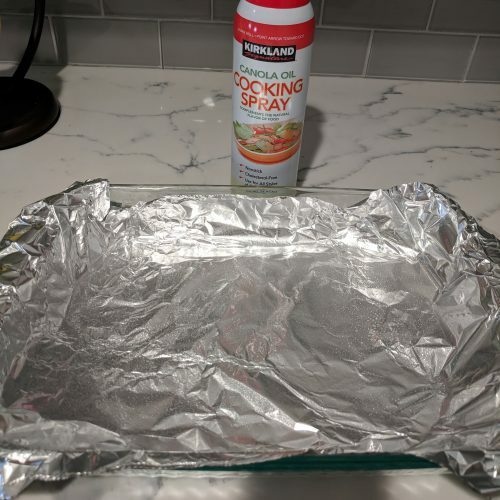 remove foil from baking dish and place onto a cutting board. carefully remove foil. line up toppings to prepare for finishing touches. Evenly distribute the toppings to the top of the rice krispies. Start with the marshmallow creme. add chocolate chips. add pecans. add mini marshmallows. lightly pressing into each topping so it sticks to marshmallow creme. add graham cracker chunks. cut and store in an airtight container. 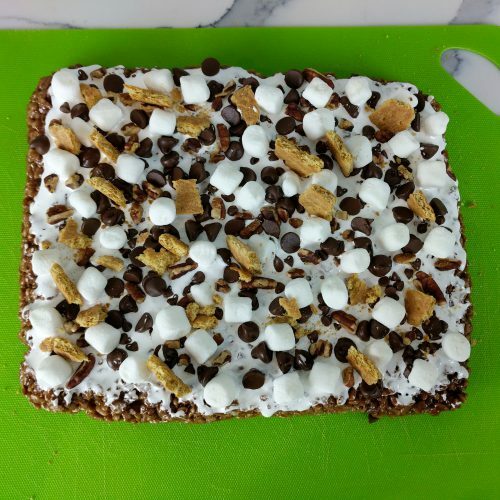 add more graham cracker chunks after it is cut to make sure every piece has some goodness! Enjoy!